Last week, I tried a wine from a region that I’d long had my sights on. The region called me through the pictures I’d seen of its rugged, steep landscape and the stories I’d read of the cultural mash-up between Italians, French, and even Germans. It was a wine from Val d’Aosta. 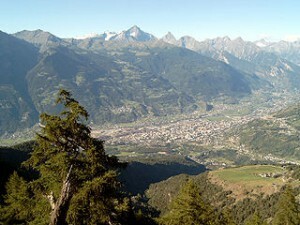 Val d’Aosta is the autonomous region in Italy’s northeast corner, smack in the foothills and shadows of the Alps. Over the years, Val d’Aosta has been ruled by many – but the community has always been reclusive and kept to itself. This shows in the wine. Only the most knowledgeable wine buffs could recognize half the varieties that are allowed in the all-encompassing Val d’Aosta DOC. The viticulture is centered around the southwest flowing Dora Baltea river, which traps heat and reflects light to the vines, most of which peer south to the river, not unlike in Germany’s Rheingau. Varieties in Val d’Aosta range from the well-known — like Nebbiolo (called Picotener or Picotendro, locally), Gamay, Pinot Noir, Pinot Gris and Chardonnay — to the local specialties, like Fumin, Petit Rouge, Petite Arvine, and Prié Blanc. Specifically the 2010 bottling from Grosjean Freres. Few wines from the region are exported, but this variety has a solid following locally. The only other place I’ve even found it mentioned is in Switzerland, in the Swiss Grand Cru appellation of “Conthey” in Valais. On the nose, the wine delivers handfuls of dried sweet spices, craisin, spent violets, and lots of rocky earth. 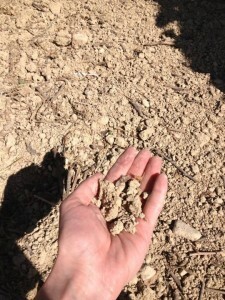 The soils in Val d’Aosta are stony, glacial leftovers with a mix of sand and limestone, distributed rather evenly throughout. Aspect and elevation create the differences in microclimates. The palate offered juicy yet tart red fruits, savory and sweet spices, and a solid, rustic grip, not unlike what I’d expect from a local Picotener. As expected, the acidity was bright but not painful. The valley sees a lot of sunlight as it is shaded by mountains from harsh weather, but the nights are always brisk. The wine was tremendously complex, especially considering it’s aged only in steel. Without question, it’s one of the most dynamic reds I’ve tasted that hasn’t seen oak. I’m looking forward to opening some of these bottles at the restaurant this summer if any guests as for a complex red that isn’t brooding. Late last week, David White and I got together for dinner at Medium Rare, a DC restaurant that serves nothing but steak and french fries. A little bit about the wines. Chappellet was founded by Donn & Molly Chappellet in the late 1960s after André Tchelistcheff suggested they make wine on Pritchard Hill. I would have taken his advice, too. Pritchard Hill is a rugged, high elevation site east of the Silverado Trail overlooking lake Hennessey with a constant breeze from the Foss Valley. Though it’s difficult to farm, the results appear in bottlings — producers like Continuum, Colgin, David Arthur, and Bryant Family are also willing to deal with the struggles of the land for the resulting concentration and longevity of their wines. Clos Fourtet is one of the handful of “Clos,” or walled, vineyards in Bordeaux’s right bank. The walls date back to when it was a fort for the town of St Émilion. In the mid-1950s, the focus of the vineyard was brought to Merlot, which was natural considering the clay driven soil on the right bank. Merlot now occupies 85 percent of the plantings, followed by Cabernet Sauvignon at 10 percent and a mere 5 percent of Cabernet Franc. This vintage, 1998, was a seminal year for the right bank. While the big boys in Margaux and Pauillac were experiencing late-season hail and rain, the right bank was ripening and harvesting its Merlot like a champ. Vintage-driven prices seem to leave great value inn Pomerol and St Émilion. 2008 was another example. Seek them out. Both of the wines exhibited great, long, sweet tannins driven by fruit ripeness and oak (the Chappellet saw 100% new French oak, while the Clos Fourtet saw 80%). The Chappellet was undoubtedly riper and more fruit driven, whereas the Clos Fourtet was drier, savory and had a touch of Brett to it (no complaints). Each has a solid 10-20 years left for prime drinking. A few weeks ago, I attended Wines of Portugal’s “Academia do Vinho,” which featured a high-spirited lecture from master sommelier Doug Frost and a tasting of 18 wines. I have to admit, I like Portugese wines because they can provide great value at the low end. The wines at the tasting reinforced this — 15 of 18 wines retail for $25 or less, and most showed vibrant fruit, food-yearning acidity, and refreshing minerality. At the high end, we tasted the very complex 2010 Niepoort “Batuta,” which showed strong tannin, dried vanilla, sweet spices, unctuous dark fruit, and a load of the schistous minerality for which the Douro region is known. This wine rings up at around $80, “if you can find it,” commented MS Keith Goldston. I’d love to revisit this wine in ten years. The other wines would also be fun to watch evolve, especially because the “great value” in Portugese wines could be gone by then. While the Batuta was delicious, my wine of the day was from the Dão region. Located in north-central Portugal, the Dão produces about three times as much red as white from high-altitude vineyards marked by granite soils. But where there’s great red wine, there should be great white wine. Enter Encruzado, the most plentiful white grape in the Dão. The 2010 Quinta de Cabriz Encruzado was our third wine of the day and offered savory notes of sage, basil, and dried mint. Kaffir lime, orange blossom, and meyer lemon fleshed it all out. The kicker was the the texture. All of these elements sat on a broad, waxy, paraffin-like surfboard that delivered an extraordinary mouth-feel. The wine spent six months in French oak, which really rounded it out while also adding beauty and softness. I side more with the Bordeaux comparison, and that’s why it’s no wonder I am a fan — I’ve fallen in love with Sémillon this year. And at $14, this wine is a no-brainer. 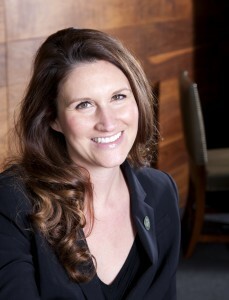 Julie Dalton first discovered wine while a student at Texas A&M. While there, she had a job waiting tables — and as her passion for wine blossomed, the sommelier at the restaurant where Julie worked became a mentor. After graduation, Julie worked in the biotech industry but continued to nurture her interest in wine — becoming a part-time sommelier at Ranazul Tapas and Wine Bistro in Fulton, Maryland, in 2006. In 2010, after 12 years in biotech, Julie decided to follow her dreams and go into the wine business full time, landing a job with Terry Theise and Michael Skurnik Wines. After a year, she returned to hospitality as a sommelier at Michael Mina’s Wit & Wisdom. There, at the new Four Seasons Hotel in Baltimore, you’ll find Julie happily creating pairings with Chef Zachary Mills’ cuisine. Check out our interview with Julie below the fold. On my recent tour of Greece (Part 1; Part 2; Part 3) I got to spend quite a bit of time with Zoltan Szabo, the sommelier at the Trump International Hotel & Tower in Toronto. Zoltan’s personality is infectious — and he kept our entire group smiling. Zoltan’s path to his current position is rather unique. Before coming to Canada, he operated a booze boutique in his native Transylvania. When he arrived in Toronto, he came without any money and without any fluency in English, but soon landed a job as a dishwasher of a highly reputable restaurant. 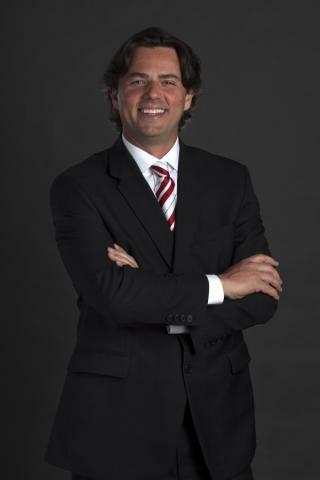 He quickly worked his way up, eventually becoming the maître d.
In 1999, Zoltan headed to school to become a sommelier and has since gained recognition as one of the top sommeliers in Canada. When we hung out in Greece, it was obvious that his knowledge of wine is vast. And his appreciation of wine is second to none. Each week, as regular readers know, we pose a series of questions to a winemaker. This week, we’re featuring Bill Nachbaur, who runs Acorn Winery in the Russian River Valley together with his wife, Betsy. Bill spent most of his career as an attorney. But in 1990, after deciding to purchase the 100+-year-old Alegría Vineyard, he retired from law to become a farmer. 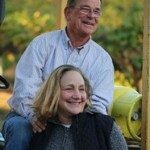 Betsy joined the winery full time a few years later. Early on, Bill and his wife sold most of their grapes to wineries like Ridge and Rosenblum. In 1994, they decided to make some of their own wines and established Acorn. 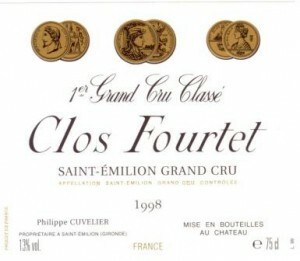 The first wine — a 1994 Sangiovese — was released in 1996. The Nachbaurs are big believers in field blends. Indeed, every wine they produce includes “multiple grape varieties [that] are grown together, harvested together, crushed, and co-fermented.” The Alegría vineyard is home to Zinfandel, Syrah, Cabernet Franc, Sangiovese, Dolcetto, Petite Sirah, Alicante Bouschet, and many lesser-known varieties, about 40 in all. Acorn’s portfolio also includes a rich and pretty rosato of Sangiovese, a Cabernet Franc, and a savory yet modern Syrah. Ever visited a winegrowing region and not been impressed by its beauty? Didn’t think so. Santorini was beautiful — the vineyards were rustic, planted haphazardly. The following day we traveled from Athens west to Nemea, where cliffs intermingled with well-trained vineyards, olive trees, and small towns. We were in the the most important “Protected Designation of Origin” (PDO) of the Peloponnese peninsula and could sense this tasting was going to be something special. The only dry red appellation of the Peloponnese peninsula, Nemea can be viewed in 3 sections of altitude. The valley floor rises from 750 to 1400 feet, with a mixture of clay and limestone soils. Many of the unoaked, young drinking wines are grown here. Above 2100 feet, the grapes retain their acidity and produce much of the rosé bottlings. In the middle is where the limestone takes hold of the vines and yields the most age-worthy wines, all made from Agiorgitiko. Say it with me: eye-ore-YEE-tee-koh. Also known as Saint George, it is the sole grape of the Nemea appellation wines, and only dry red PDO of the peninsula. The wines were pretty, showing red fruits of ripe to dried character, lots of savory notes ranging from herbs to meat and smoke, abundant acidity and a range of oak treatments. If a red PDO wine is labeled as “Reserve” it must spend a year in oak, six months in bottle and a total of two years aging at the winery. “Grand Reserve” wines require 18 months each in barrel and bottle. Many producers are blending Agiorgitiko with Cabernet Sauvignon, Merlot, Syrah, and other grapes, but in my opinion, it’s best left on its own. It has a unique and delicate structure easily overpowered by others. Santorini. It’s as beautiful as advertised. Widely considered the top wine region of Greece, Santorini is essentially the leftovers of a cataclysmic volcanic eruption circa 1,500 BC. The detailed history can be greatly explained by a tour guide at the ancient city of Akrotiri, where archaeologists have been excavating for 45 years. Shockingly, the city had two-story buildings and indoor plumbing 3,500 years ago! The volcanic soil on the island has left Santorini with some of the oldest vines in the world — some are well over 100 years old. The high Meltemi winds, presence of sand, and lack of organic matter leave phylloxera with nothing to survive on. 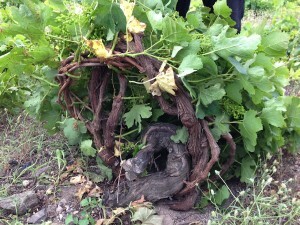 The same blustering gales forced development of a vine training system where the vines are intertwined within themselves, forming a basket to protect the fruit. That precious fruit is generally Assyrtiko, a grape that can be blended with Athiri and Aidani to qualify for the “Santorini” appellation status. Most wines show high minerality, screaming acid, and spice, which is occasionally tamed by French oak. Old Assyrtiko, showing the basket weave. If you are Tuscan, stop reading now. Santorini is believed by many in the area to have first produced what is now called Vin Santo. Assyrtiko grapes are dried on mats to the desired level of desiccation, and after a slow fermentation, are aged in barrel for an extended time. We tasted one that spent 20 years there. Thus, many different profiles of vin santo exist, ranging from just sweet enough to unctuous and lavish. After 16 hours of transatlantic travel with screaming babies, no sleep, and little sustenance, I was ready for bed. It was, after all, 2 a.m.
Or at least it felt that way. It was actually 10 a.m. and I had a full day of climbing ancient ruins and tasting wine in front of me. Yikes. Fortunately, the Greek have heard of espresso. It was at the Sofitel Athens — directly across the street from the airport — where I met up with 14 other wine personalities in the same destitute emotional state, yet all abuzz about embarking on the tour of a lifetime. Some came from as far as San Diego, so I certainly couldn’t complain about jet leg. Luckily, our hosts, Sofia and George from New Wines of Greece, were ready for us. 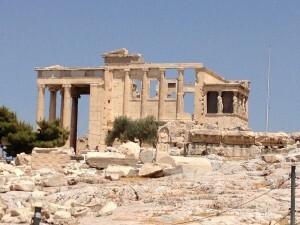 We started with a cab ride to the Acropolis, a can’t miss when in Athens — even if you’re only there for a day and your positively exhausted. Also, be sure to get a tour guide. Ours was passionately Greek, and there’s not much direction for guests who are on their own. In looking over the whole itinerary prior to the trip, I thought this might be the weakest tasting of the trip. If this proves to be the case, wow. Of the 40 wines tasted, there was some definite quality. The kicker is that several of them cost less than $13. Trimbach has been written about before. And I have to admit that early in my wine days, I wanted to write off the winery. With its solid yellow labels and its seeming omnipresence (over 30% of Alsatian wine in the United States is Trimbach), it just seemed so generic. But the truth is that the wines are fantastic. My non-wine-aficionado family still remembers the Trimbach Pinot Blanc we had at a celebratory dinner years ago, and I certainly can’t let it go unsung, especially after having tasted much more of the winery’s lineup. 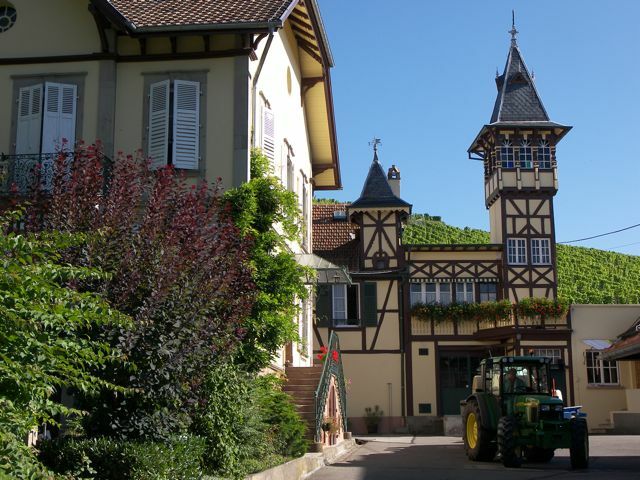 Trimbach is currently headed by brothers Jean and Pierre Trimbach, who focus almost exclusively on marketing and vineyard/winemaking, respectively. Jean’s son Julian is currently studying viticulture and oenology in Dijon and will join his uncle back in Ribeauvillé after graduation, becoming the 13th generation to man the ship.